As I present this second rule to my students on the second and eighty-second days of school, I tell them that I can successfully predict their future success and happiness by a single factor: picking up trash. Someone who is truly responsible will not only pick up their own trash, but willingly picks up trash when they see it because it needs to be done. Now, you might think this is only enabling the bad behavior of others. I see the argument. But what about those who don’t pick it up, are they doing the right thing? No. Or those who protest? Does this get the trash off the ground? Hmm. Not necessarily. Yes, someone was careless or even deliberate in leaving the trash, but does this excuse me from doing what I know is right? At the end of the day, there are those who allows themselves to be suffocated in trash, and those who simply pick it up. Now, I do have a small disclaimer before continuing to rail on the gravity of responsibility - People can do terrible, despicable things to one another that are far weightier than leaving behind a candy wrapper. Bullying, abuse, neglect, harassment are all realities which can cause immense injury to the human psyche and should not be diminished in this discussion. “They” change our impulses, or “they” make us feel a waning worth. I promise that I seek justice and love mercy for students and those I know who are on the receiving end of abominable actions, but if we simply write-off retaliation to actions of another, then we allow for all to be justified. He spread a rumor about me, so I fought him. My dad was abusive, so I refuse to discipline my children. Someone took advantage of me, so there is no reason to save myself for my husband or wife. I am here to suggest, no matter the circumstance, you, through God, are still in charge. Be responsible. The term psychologist use to describe an individual’s viewpoint on where the source of consequence and responsibility lie is called the locus (Latin: location;place). Generally, people fall into two categories or mindsets regarding the location of responsibility: the external and the internal. People with an external locus tend to believe that they have very little influence and therefore, consequence on the things surrounding them. Conversely, those with an internal locus believe they have the greatest control of their environment and outcomes. At first it would seem that being of an external mindset is the correct view for a Christian who has placed his/her hope, life, and faith God’s hands. It is true, God needs to take priority in our lives. However, there can be a fatal flaw in this thinking because there are other forces on the outside that can also greatly impact and shape our surroundings (for example, temptation, persecution, the sin of others, etc.). If I hold true to the viewpoint that I can do little to prevent it, control it, or change its effects, then whenever something happens to me that is not from God, by circumstance or consequence, my faith is shaken. We say things similar to enemies of God in Micah 7 or those who persecuted Jesus during his crucifixion, “Where is he now?” or “Why didn’t God…”, or “How could He…” We place the responsibility on God for the situation, the sin or the shortcoming, simply blaming Him for our problems and waiting for Him to repair it with our arms folded. By taking personal responsibility out of the equation, we are not increasing our trust and faith, but in fact, decreasing it. The proof is in “The Parable of the Talents” found in Matthew 25. If you empathize with the servant who was given a single talent and buried it in the sand out of fear, your locus might be externally calibrated. The Master, God, doesn’t simply desire for us to simply believe He is in control. You believe in God? Awesome! Even the demons believe and shudder (James 2:19). We are held accountable and responsible by Him; we must own our faith and act on it. This means that we are to navigate using what is placed within us (Luke 17:21; Romans 8:9); to become people whose viewpoint is fixated on the internal locus, or power within. Now, I’m not speaking of Ch’i or some other kind of innate, embedded spiritual force, but the incredible empowerment that comes through the Holy Spirit, the Good News of the Kingdom of God, and the teaching and example of Jesus Christ. These things we cling to on the inside will greatly influence the people, the environment, and the future around us. We are not simply filled, but should be overflowing with the fruit of His spiritual presence in our lives - love, joy, peace, patience, kindness, goodness, faithfulness, gentleness, and self-control. As God shapes us, we too have the power, and responsibility, to shape the lives of others by the empowerment of God. He has given us time, talents, or money, and we are not to merely hide these things and self-preserve, but have the responsibility to grow His kingdom by acting on uncontainable faith (Matt 25:26-30). Now, for the hard part -- Just because we are driven from within, there are still things fighting for control of the internal stars that are steering our ship towards salvation. This world is still filled with sin and unfortunately, sometimes sin wins in my life and the lives of the people who surround me. I may not be “of this world”, but I am very much in it, and sometimes, I must bear of the reverberating consequences that come from the absence of God. Rain falls on the just and the unjust. It is in these times when I am faced with the most difficult, the most frustrating, the most pressing, and most unfair experiences that I can see where my locus lies. 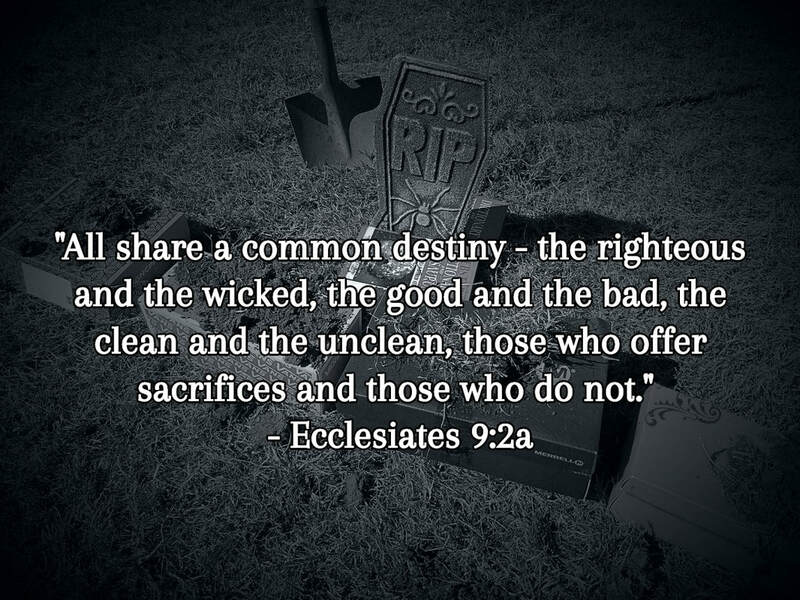 Will I continue to be responsible, acting in faith, or will I blame “them” or “Him” for my circumstance? “They” are not in control. Your attitude, your actions, and your reactions are your responsibility, undeniably traced back to you. Hopefully, you are dramatically influenced by the Spirit of God residing in you, the locus that changes the world from the inside out. It your choice. You can be a victim, spending a great deal of day talking trash, but don’t be surprised when you are surrounded by garbage. The far better choice in my eyes is to be responsible. Pick up the garbage, whether it is your own or someone else’s, chunk it in the bin. Invest, edify, influence, and become responsible for the people and world around you, and it won't be long before it starts looking more like the beautiful things that are held deep inside of you. Each year it is the same. Four months invested into impressing habits - "don't talk in the hallway", "walk on the red line", "close the door, please", "get the trash off the floor", "bring a pencil to class" - are washed away in two short weeks at Christmas break. Now, those who know me best, or really at all, know that I am the last person to preach the gospel of routine, but I see and understand the importance of structure, discipline, and most importantly, rules. Whether you're starting a new job, learning a new game, or attending a new semester of college, the first and most necessary thing you need to understand are the rules. It is the agreed upon way the collective will operate. Without rules, there is chaos, anarchy, and purposelessness (totally a word - I looked it up!). We may not always agree with the rules, but whether we admit it or not, we all are looking for rules to govern our experiences because the right rules, procedures, and routine, provide purpose, direction, safety, and value to each and every experience we have. 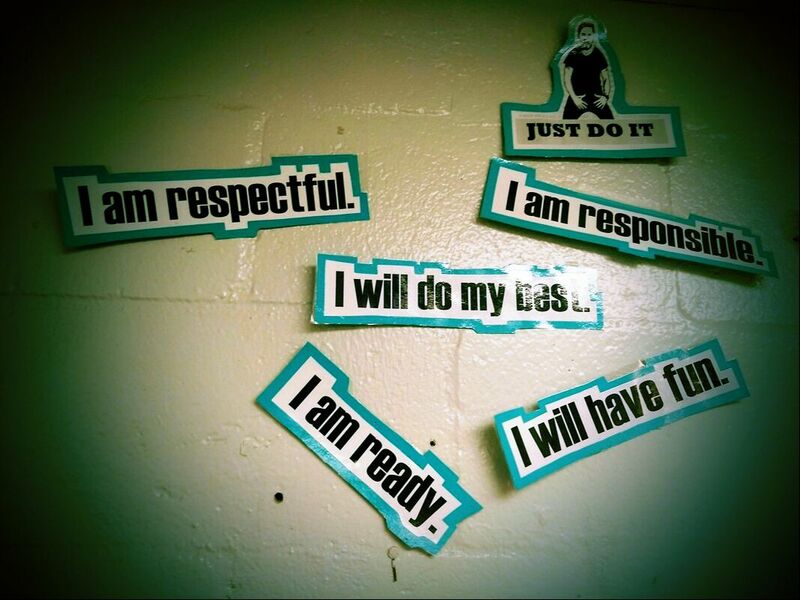 This is why the day we come back from Christmas break, I revisit my classroom rules. Before my students walk in I say the exact same thing I say the first day of school. "Welcome, sit anywhere you'd like; don't move the pillows." Secretly, this is the first pre-rule (this one is definitely not a word) I give to find out who my "rule breakers" might be. The next thing I do is remind students of my callback. It teacher terms, a callback is a call-and-response to hit the pause button on class. I countdown from five (5,9,12,4,3,7,1) to one, clap my hands, and smile, expecting my students to do the same; if there is one thing that is done every single day in my class, it is this. With the help of Shia LeBeouf, I again tell my students to "just do it", just follow the rules and this class will be amazing. They have to trust me; they have to follow; but, I promise I know what is best. Then I passionately convey five simple rules that I feel have a purpose, place, and context far beyond my classroom. The first of these rules: I will be ready. So much classroom time is wasted on the search for pencils. It would be easy to reprimand a student for this, but like Paul, I am the chief sinner. Some 20 years ago during my time as a sixth grader, the phrase most consistently uttered from my mouth was "Hey, can I borrow a pencil?" In middle school vernacular this roughly translates to "Hey, can I lose your pencil, too?" If this didn't work, I would have to waste time searching the floor's boneyard, go back to my previous class, or as a desperate last resort, embarrassingly entreat my teacher. Class didn't stop for me, and many times it left me furiously catching up on note-taking (back before you could just press a share button) or simply lost. Jesus gives a parable for the unprepared in Matthew 25. Instead of children looking for pencils, he tells the tale of ten virgins who headed to an evening wedding feast. Five come prepared, bringing enough oil to last the night's long journey, (or undoubtedly wait on the bridal party to take pictures), but the remaining five didn't bring enough oil from their lamps. They implored the prepared portion of the party, but to no avail; they only had enough for themselves. The ill-equipped five are left to backtrack to the previous town to make a purchase. By the time they have made themselves ready to revel in the celebration of the friends and family, it is too late. Every one, including the five prepared traveling companions, is celebrating without them. They are not recognized by the one standing at the door, and ultimately and disappointingly turned away. Pencil and oil are such trivial things, yet they foreshadow a much larger story. When you become unfaithful to caring for these items, you are signaling you haven't made any preparations for the important happenings in the near future. In a similar way we neglect the "little things" that collectively make up our spiritual lives and disciplines. Have you laid your day before you, praising God, praying for provision, asking to be led away from temptation, and for him to guide and direct your path (Matt 6:9-13)? If not, you are not ready. Have you spent time with a devotion or reading that you can use to edify, encourage, or to give an answer for the hope you have (1 Pet 3:15)? If not, you are not ready. Are you investing the talents that God has given you - your effort, your time, or your money - into glorifying His kingdom (Matt 25:14-30)? If not, you are not ready. Are you living with urgency in your actions and your words because his Kingdom is coming soon (Rev 22:12)? If not, you are not ready. Did the five virgins not want to dance, feast, and celebrate? Doubt it. Do my students want to be behind in class? (maybe, but) Doubt it. Do we want to miss out on the Kingdom of God? Doubt it (seriously). Yet to be ready we must make daily preparations in our actions, not simply profess our faith. Desire is not enough. Daily renewal (Rom 12:2), preparation (Prov 16:1-3), and sacrifice (Luke 9:24) make us ready for the moment whenever it comes. Don't be caught unprepared, wasting key moments searching for things you should already have. Bring your pencil. Bring your oil. Bring His word wherever you go. Be ready. "What if I Die Today?" Any student that has been in my classroom will tell you I have a dark sense of humor. They might tell you that there are bodies in my closet or they attended a funeral for "said", "nice", and "bad" (as pictured above), but the best (or worst) example is in our homeroom's birthday celebration. We do not sing "Happy Birthday" like the other classrooms, or really, the rest of the world. We sing a version that closely resembles a funeral march that I borrowed from a friend in youth ministry - "happy birthday, happy birthday, misery is in the air, people dying everywhere, ​happy birthday." After our depressing dirge concludes, I announce to the classroom, "Congratulations, _________ , is one - year - closer - to - death!" Candy is thrown at the student, and there is uproarious cheering and applauds. Although this may appear dreadful and in bad taste from the outside, time and time again, I have students lean in to confidentially tell me, "just so you know, I will be one year closer to death tomorrow," so we don't miss out on the celebration. Like many of the decisions I make, the students enjoy it, so we continue to do it, even if it is a bit out of the ordinary. In stark contrast to this ironically gloomy ritual are the facts. Do I really want to die? No. Do I really want my students to die? Absolutely NOT! However, I know the nature of death. It is the ever-looming presence in the shadow of all the lives of all men (and women, boys and girls). It is the wage of sin (Rom 6:23) that can demand payment at any point. But our lives don't acknowledge it, we don't talk about it, and we spend our days as if eternity has already been achieved. Here lies the the problem with death. It is the one unavoidable aspect of our lives (if you don't include taxes, Benjamin Franklin), yet it is the topic we would most like to avoid. Well, now is the time to begin coming to terms with this ever-present issue. It was a few weeks ago when we happened upon a serious discussion about death in my classroom. We were dissecting a quote by George H. W. Bush, who most recently passed away. He roughly stated that the solution to every problem starts with education. A student, who disagreed with the quote, rather bluntly, as the nature of being 11 or 12 years old, shared his opinion, "How does education fix the problem with death?" I shook my head, and pursed my lips. It was a good question and a valid point. What do I know about death? Two things for sure. 1. I know it will happen one day, and 2. it could happen at any moment. As I speak, I could have free radicals floating inside of me that could be forming the cancer that will take my life. With my family's history of heart health (and my consumption levels of bacon), I could have a heart attack in my early 30's that will cause me to flatline. I could collide with another vehicle at the end of the school's block and not get to the hospital in time. Even if I stayed home to protect myself, there are dangers lurking in the kitchen, bathroom, and there is risk of a home invasion. Knowing this, pretty much every morning I ask the question, "What if I die today?" I think about that question when I get into a car without my wife and tell her, "I love you," and give her a kiss goodbye. I think about it whenever I greet and leave my family and friends with handshakes and hugs. I think about it when I am singing in the morning at my classroom door, or giving correction with "you are better than this behavior," or telling you right now, "I love you." I think about it as I try to remain positive in difficult conversations, or when I am speaking kind words to people I don't necessarily get along with. Most importantly, I think about it with my faith and how it will be remembered. It drives all the other actions, and it helps me to educate myself on death even more. So do I think about death? All the time. Will I die? Yes. Do I want to die? No. Do I worry about it? Not really. I take action on what I know, so today will be an okay day to die, if I must, and I will be at peace knowing I fell asleep in death giving it my all. "Can any one of you by worrying add a single hour to your life?...But seek first his kingdom and his righteousness, and all these things will be given to you as well." At the conclusion of these words, there were a few tears in the room, most filling the cracks between my eyeballs, lids, ducts, and sockets. I didn't want to talk about my death, and thankfully, my students didn't want to talk about my death either (well, at least that day). So how does the problem with death change our lives? The challenge my students considered is yours as well (and mine, because being honest, some days would be better days to die than others). What if you knew 2019 was your last year? What would you do different? Who would you spend your time with? Where would you go? What would your conversations be like? How much does your life resemble the things you would or wouldn't do if you knew you had a few fleeting-vapor, dust and shadow moments left? Whether death comes today, or in the next century, we can educate ourselves and take action in faith, not against death itself, but in the life lived for the assurances that lay beyond it: a coming day with no more pain, fear, or sting. Congratulations! Today, you are ONE-DAY-CLOSER-TO-DEATH. <Applause> Now, what will you do to celebrate the hope you have? Over the course of the last month or so, my classes read aloud Serafina and the Black Cloak by Robert Beatty. To say that students as a whole enjoyed this book would be an understatement. Students audibly gasped as the plot twisted, they frantically turned pages in the middle of intense action, I heard chuckling, saw misty eyes, and there was even a riot formed when we stopped at a cliffhanger (I legitimately feared for my life around Chapter 17). I was taken aback with how much this book resounded with each student. I thought 12 year-old boys wearing camouflage wouldn't be interested. They were. I thought my students who struggled with reading would get lost in the myriad of vocabulary. They weren't. Why? There are so many truths and resounding messages hidden in a story of a girl who secretly lives in the subbasement of The Biltmore House. Like almost every coming-of-age tale, Serafina must decide her place and her purpose in her surrounding world. This internal conflict moves alongside the major aspect of the plot, battling The Man in the Black Cloak, and culminates into a series a questions about the nature of good and evil. 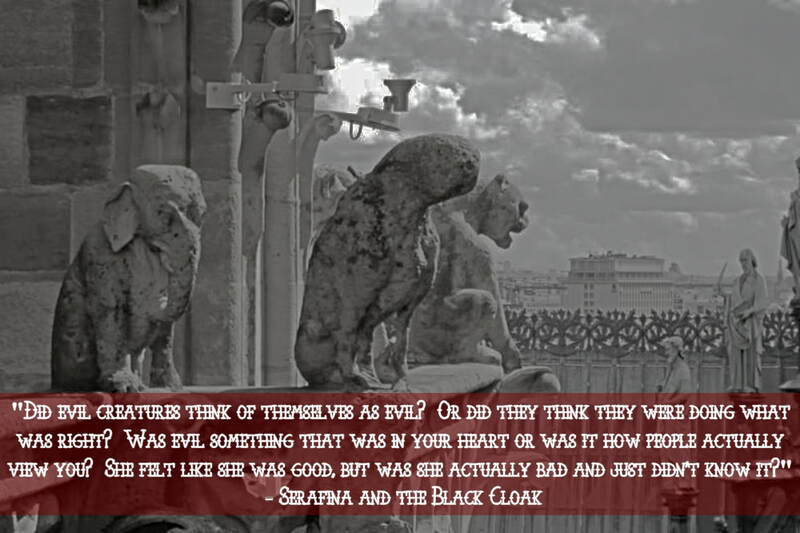 Serafina is a "creature of the night", but does that mean she is intrinsically evil? Aware of the eye rolls and sighs I was about to receive from the students who "just want to read the book", I stopped our reading to play the devil's advocate (ironically), asking this loaded question, "Can you give me an example of someone who was born evil?" In six or seven small groups, discussion commenced. After a few moments, hands went up into the air, readied to make a compelling case. Examples came pouring in: a baby being addicted to a drug his/her mother took while they were pregnant; lifestyles that play out generation after generation; and two subjects being exposed to the same stimuli, yet one makes the right decision and the other, the wrong one. Another flurry of hands went into the air. Either there was a contagious epidemic of full bladder sweeping the room, or a rebuttal was coming. Fortunately for our class and our poor outdated bathrooms, it was the second. One after another, students made arguments that decision was the most important element in each one of these cases, not the nature of birth. Ultimately, with some concession from both sides, we came to the conclusion there may be "mentalities" and "inclinations", but choice is key. Since the existence of man, there has been choice. Originally, the choice between good and evil was simple; eat from the garden as God commanded or eat the forbidden fruit. In Genesis 3, Adam and Eve make the wrong choice. Because of this, not only does sin enter, but also death (Rom 5:12). Does Adam's flaw or "original sin" get passed from generation to generation at the amino acid level of your DNA? Or is it a culmination of your learned responses from watching sin being practiced? While there are certainly arguments to both side (Psalm 51:5; Jeremiah 1:5), I believe the answer is simple to the question "Are we born evil? ": It doesn't matter. If you were born craving a drug or became an addict as an adult, if you were a victim of abuse or you are the abuser, if you lie, cheat, or steal to amass riches or merely survive, if your mom or dad left you or if they passed away before their time, or if you're full of unused potential or pushing hard with your widow's mite - you still have choice. While we say Adam's choice was easy, our's is pretty much identical - listen to God or don't. Ultimately, the confession and the corresponding conduct to follow the way of Jesus (Rom 10:9-10) or the selfish selection of temptation and sin (Jam 1:13-15) has more to do with your heart than your heritage. This is why it is possible the Kingdom of God will be filled with people like Zacchaeus, a cheating tax collector, John Newton, a slave trader, and an unnamed thief who was crucified alongside Christ. They all were creatures of the night, like Serafina (and really, us too), but just as Serafina, ultimately chose good. Conversely, the "good" they chose in not simply a feeling, but an action, a repented life lived for their Savior, Jesus Christ. Each of them was covered in grace, and it changed their lives and eternal outlook. 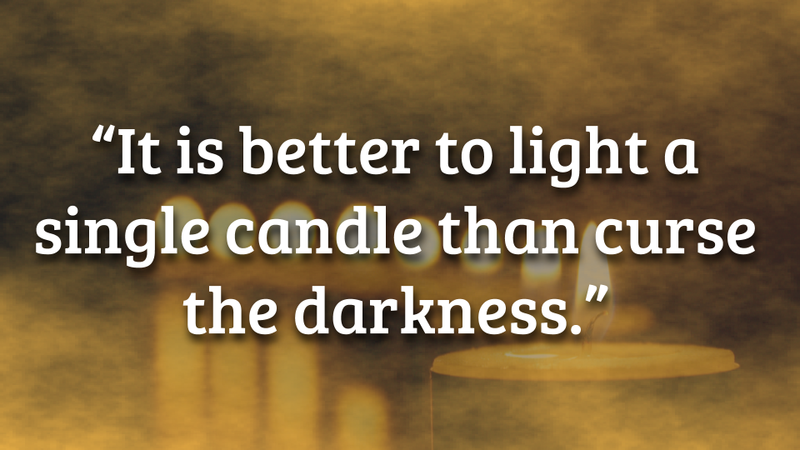 Just like them, no matter our heritage, we can choose the Light over darkness. Does it matter if we are born evil? Thank God, no. It only matters that we are reborn with a new heritage; the one that leads us to be called the sons and daughters of God. A sixth grade classroom would seem an unlikely place to have a discussion about the source of wisdom. Even more unlikely in my classroom, where I teach compound commas with the "but crack" test, where we answer multiple choice question like chainsaw murderers, or where I have taken 15 seconds of class time to ensure the proper spelling of "turd". Now I promise each of those things have a teaching context, but they all were pretty silly nonetheless. In stark contrast, I am equally deliberate about the not-so-silly features of my classroom, as I really want my students to walk away with moral-shaping, life-altering truth. One of the ways we consider the serious things is a weekly quote that is placed on the board for us to discuss as a warm-up; it is called "Wednesday Wise Words" (alliteration anyone?). We consider the words of authors, presidents, social activists, religious leaders, athletes, and more, and simply state what they mean, explain if we agree or not, and then talk about what it means in our life. Many times these discussions hit deep understandings that are worthy of discussion in the Agora, seminaries, and synagogues. 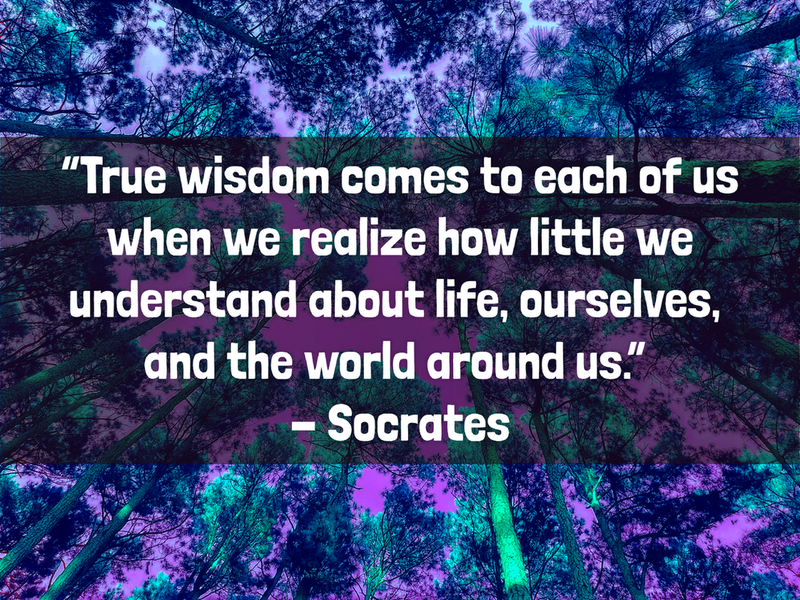 This was never more truth than this past week when we considered a quote by Socrates, "True wisdom comes to each of us when we realize how little we understand about life, ourselves, and the world around us." As we discussed, we danced around the emotional implications of not knowing what others are going through, the role of a student and the nature of learning, but at some point in our discussion we entered (albeit ironically and undeliberately) the Socratic method relating to astronomy - "How much do we know about the Earth? The moon relative to Earth? The solar system relative to the moon? Our galaxy relative to the solar system? Other galaxies and the universe as a whole compared to our own galaxy?" In a strange resemblance to Horton Hears a Who and Psalms 103:14-16, the students concluded that we are floating on a speck in the infinitely greater world around us, therefore our wisdom is simply "garbage" (their word). ​To expound on collective thinking of my students (and Socrates), the smartest people realize that simply cannot understand it all, so all conjecture or "garbage" understandings, scientific or religious, must be steeped in an element of faith. Additionally, what seemingly is chaos, may very well be a construction by such an elaborate order than our minds cannot even begin to fathom it (see: chaos theory). As I sat in my chair at the end of the day, rubbing my temples and staring off into space, (like many of my students at the end of the discussion, as some screamed, "STOP! Our brains hurts!") I couldn't help but think my God, the Creator of the heavens and the earth. Just when we think we have built a mighty tower, acquired a powerful technology, or unlocked a great understanding or discovery, we only need to wait for the sun to set. On constant display from our "speck" is His majesty; the night sky holds our humility. It is a landscape so vast that we cannot see it with the naked eye nor do we really know how far it extends. Almost every bit of it is untouched by anyone except God, our creator (Psalm 19:1-4). He has set order and motion in the infinite heavens with a logarithm that passes beyond our comprehension, so we might know Him. Yet even this elaborate scheme is subordinate to an even higher order: the salvation plan of Jesus Christ. Colossians 1:17-18 states everything is made through Jesus Christ, he is before all things, and hold all things together. This is not simply speaking of the heavens and earth (if we can do such things), but of time, relationship, and the interaction of all of these things simultaneously. When we look at the advent of Jesus Christ we can see a glimpse into the deep, ordained will of God that is guiding, directing, and even physically shaping the universe. The alignment of heaven - a star in the sky (Num 24:17; Matt 2:7), time - to fulfill prophecies in their fullness (Galatians 4:4), and relationship - genealogies, shepherds, magi, John the Baptist, Simeon, and even us. Jesus Christ was born, lived, died, and was raised back to life as our example, actively mediating, interceding, and realigning us back to the driving will of God (Rom 8:34, 1 Tim 2:5). The heavens, so vast and incomprehensible that we really have no context to understand them, share not the single message there is a great and awesome God (Rom 1:20), but the he has planned for us (Gen 15:5) and loved in the same vast and incomprehensible way (Psalm 35:5). So what is true wisdom? Realizing that most of the time we will never see, comprehend, or know the cataclysmic effects of the choices we make, but knowing they are indeed tied to the orchestration of God's ultimate will for us all - that none should perish, but all have everlasting life (2 Peter 3:9). He has given us a way to be a part of this plan, principles to live by in order to be aligned to the plan, and a hope that spawned the entirety of the plan to exist. Do we have to know everything? No. We have to believe. The assurance comes from the Creator, through His heavens, His word, prayer, and sometimes in the most direct forms. The irony of it all - when we let go of the "garbage" understandings we have about life and believe in something that we cannot fully comprehend, we will never make a wiser choice. Get notifications for new blogs! If you would like the newest blog post to your inbox, simply type in your email address in the box above. Worship Leader, Sixth Grade English Teacher, Pastor's Kid, and a Man.